Behcet’s disease is an inflammatory disorder characterized by the presence of oral aphthous ulcers, genital ulcers, uveitis, and skin lesions. Behзet’s disease is an inflammatory disorder of unknown cause. There is a striking geographical distribution, it being most common in Turkey, Iran and Japan. The prevalence per 100 000 is 10-15 in Japan and 80-300 in Turkey. There is a link to the HLA-B51 allele (a split antigen of B5), with a relative risk of 5-10; this association is not seen in patients in the USA and Europe. Behcet’s disease is observed in two different geographic locations. * One is observed in individuals living in Japan, Korea and Turkey. * In those areas the prevalence of HLA-B51 is higher in patients with Behcet’s disease. * Incidence in men and women 1:1. * Behcet’s disease typically affects individuals in the third to fourth decade of life and primarily presents with painful aphthous oral ulcers. The ulcers occurs in crops measuring 1 to 10 mm in size and found on the mucous membrane of the cheek, gingiva, tongue, pharynx, and soft palate. * Genital ulcers are similar to the oral ulcers. * Decreased vision secondary to either uveitis, keratitis, vitreous hemorrhage, or occlusion of the retinal artery or vein may occur. * Skin findings including papules, vesicles, folliculitis, and acneiform and erythema nodosum-like lesions can be found on the proximal extremities and trunk. * CNS meningeal findings including headache, fever, and stiff neck can occur. Cerebellar ataxia and pseudobulbar palsy occur with involvement of the brainstem. * Vasculitis leading to both arterial and venous inflammation or occlusion can result in signs and symptoms of a myocardial infarction, intermittent claudication, deep vein thrombosis, hemoptysis, and aneurysm formation. The cardinal clinical feature is recurrent oral ulceration. The international criteria for diagnosis require oral ulceration and any two of the following: genital ulcers, defined eye lesions, defined skin lesions, or a positive skin pathergy test. Oral ulcers can be aphthous or herpetiform. The eye lesions include an anterior or posterior uveitis or retinal vascular lesions. Cutaneous lesions consist of erythema nodosum, pseudofolliculitis and papulopustular lesions. Other manifestations include a self-limiting peripheral mono- or oligoarthritis affecting knees, ankles, wrists and elbows; gastrointestinal symptoms of diarrhoea, abdominal pain and anorexia; pulmonary and renal lesions; a brainstem syndrome, organic confusional states and a meningoencephalitis. All the common manifestations are self-limiting except for the ocular attacks. Repeated attacks of uveitis can cause blindness. The pathergy reaction is highly specific to Behзet’s disease. Skin injury, by a needle prick for example, leads to papule or pustule formation within 20 - 40 hours. Blood tests usually show raised ESR and CRP but not autoantibodies. The etiology of Behcet’s disease is unknown. 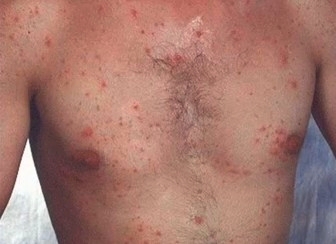 An immune-related vasculitis is thought to lead to many of the manifestations of Behcet’s disease. What triggers the immune response and activation is not yet known. The diagnosis of Behcet’s disease is a clinical diagnosis. Laboratory tests and x-ray imaging may be helpful in working up the complications of Behcet’s disease or excluding other diseases in the differential. There are no diagnostic laboratory tests for Behcet’s disease. CT scan, MRI, and angiography are useful for detecting CNS and vascular lesions. Treatment is directed at the patient’s clinical presentation (for example: mucocutaneous lesions, ocular lesions, arthritis, GI, CNS, or vascular lesions). Corticosteroids, immunosuppressive agents and ciclosporin are used for chronic uveitis and the rare neurological complications. Colchicine helps erythema nodosum and joint pain. Thalidomide may be useful in some cases although side-effects of drowsiness and peripheral neuropathy are common. It should not be used in pregnant women because of phocomelia (limb abnormalities). b). In CNS vasculitis, cyclophosphamide 2 to 3.5 mg / kg / day is used. Prednisone can be used as an alternative. c). Heparin 5000 to 20,000 U / day followed by oral warfarin. * Chronic therapy is usually continued for approximately 1 year after remission. * Surgery may be indicated in patients with complications of bowel perforation, vascular occlusive disease, and aneurysm formation.